Takeaway: More than half of all falls occur at heights of less than three meters and most of these are from ladders and roofs. Almost all of these falls are preventable. According to OSHA, falls are the leading cause of death in construction year after year, and account for one third of the on-the-job fatalities in the industry. Each year, falls claim the lives of over 200 workers and injure about 10,000 more. In 2015 alone, 364 American construction workers fell to their deaths (learn more about OSHA's Fatal Four). In this article, we'll look at some of the responsibility we all share to lower this number and some common sense ways to do so. Working at heights doesn't just include the high altitudes experienced by workers in cherrypickers or high-rise window cleaners. In fact, more than half of falls on the job occur at heights under three meters, mostly from ladders and roofs. Residential building sites see more injuries from falls than any other sector of the construction industry, and more falls happen to roofers than any other type of construction worker. The causes of these falls run the range of possible risks. Some are caused by not using proper safety measures, some are caused by using safety equipment but not adjusting, some are caused by tripping due to bad housekeeping around the worksite. But in almost every case, these fatal falls are preventable (one major step is using the right system–see Arrest or Protect: Your Guide to Choosing the Right Fall Protection System to learn more). OSHA is chief among a number of organizations trying to bring the rate of falls down. OSHA has launched an education campaign in order to raise awareness in the construction and other industries about preventing falls from ladders, scaffolds, and roofs. The awareness initiative includes a resources page, training tools for employers, and posters to display at worksites, which is available on their website. OSHA's mantra of "Plan, Provide, Train" for protecting roofing workers provides some solid guidelines and explicit requirements and responsibilities for keeping people safe when working up high. Employers are responsible for providing safety gear so work on roofs can be done safely. In addition, any employers who expect their workers to be on roofs must provide education and training about workplace safety before workers are sent to work. Limited English proficiency is an issue in the construction industry, so resources, training, and safety rules must be communicated to workers in a language and diction that they understand (see 5 Steps to Creating a Culturally and Linguistically Diverse Workplace for related advice). Many of the new resources OSHA is introducing in partnership with the National Institute for Occupational Safety and Health (NIOSH) and National Occupational Research Agenda (NORA) - Construction Sector are specifically prepared for a target audience of workers whose first language is not English, and those who have limited English proficiency. 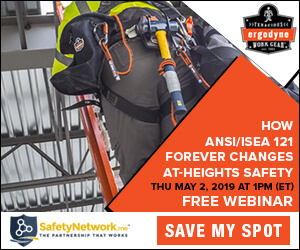 When employers expect their workers to be working from heights, on ladders, scaffolds, and roofs, they must plan projects to ensure on-the-job safety. This includes identifying potential hazards, assessing these hazards, and developing a plan for working safely within the confines of these hazards or eliminating them if feasible. When bidding on a job, the employer needs to take into account time required to set up a safe working environment and train workers to do their jobs safely. The employer also needs to factor in the cost of materials and equipment needed to complete the job safely. Any work environment six feet off the ground or higher is deemed at risk for serious injury or death resulting from a fall. Workers at heights must be provided with fall protection equipment including proper ladders, scaffolds, as well as personal safety gear. Since different ladders and scaffolds are required for different jobs, the employer must be sure that the equipment is the best fit for the safe completion of each individual job (for more, see Prevention: Slips, Trips and Falls). Any employee working on a roof should have a personal fall arrest system (PFAS) that fits properly and is in working order. Workers should be taught how to use a PFAS and proper fitting procedures. Moreover, the employer or a supervisor must check regularly to ensure that the PFAS is in good working order and each employee working on the roof is wearing the required PFAS (for more, see our Safety Moment on Choosing the Right Fall Protection Lanyard). Falls can be avoided when every worker – not just the ones working on roofs – knows how to check, install, and troubleshoot for PFAS equipment and worker misuse of it. Knowledge is power. Employers must ensure every worker understands the proper set-up and safe use of all roofing equipment. Hazard recognition is the responsibility of every worker, and all workers should be thoroughly trained to spot problems and correct them. Moreover, training on equipment and PFAS should be reviewed regularly like a fire drill. Equipment and staff change, so training should be reviewed and refreshed (find out why you should Invest in Employee Training). Through training sessions, posters, brochures, and safety workshops, employers can build employee awareness of safe practices for working on roofs. Training should be ongoing so wearing PFAS and using the right equipment for the job in the correct way becomes second nature to all employees. As previously mentioned, organizations like OSHA, the Ministry of Business, Innovation and Employment, and NORA have resource materials available to build worker awareness and help in training employees. Safety conscious groups like the Ministry of Business, Innovation and Employment expect that not only employers and contractors, but also their staff, independent contractors, and DIY renovators will actively manage and work to prevent any potential for falls from rooftops. These individuals likely do not work on rooftops on a daily basis and may not have experience with this workspace. All too often, they also don't have the right safety equipment or proper training on how to use it. Frequently, they are also working alone, so there is no one to troubleshoot their equipment or technique. In these situations, the employees should be pointing out the safety gaps to their employers and, as we saw, it is the employer's responsibility to provide the protection and the training (for related reading, check out Why Creating a Safety Culture Is Better Than Relying on Compliance). Workers, employees, and DIY homeowners all have a responsibility to ensure that they are working with the correct equipment for the job and using it properly. When it comes to employers and employees, the employer must provide the equipment and training. If the worker notices that either is lacking, it is their responsibility to bring it up with the employer. Interestingly enough, more roofing accidents per capita occur to DIYers than any other single group. This is because a DIYer is more likely to cut corners on a "one-off" job and do it without proper safety equipment. People will always debate the merits of having a professional do work you can technically do yourself, but if you can't do a job safely, you probably shouldn't be doing it at all.